Convert FreeOffice and SimpleStats docs to MS Office format. Is there a better alternative to EasyDoc Converter? Is EasyDoc Converter really the best app in Productivity category? Will EasyDoc Converter work good on macOS 10.13.4? 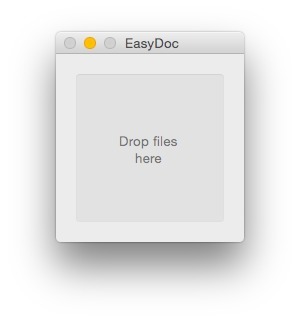 EasyDoc Converter is a fast and simple file converter for OS X. Instantly convert your FreeOffice (.fof) and SimpleStats (.sst) docs to Microsoft Office (.docx) by dropping your file onto the app. EasyDoc Converter is great for employees and students looking for a simple tool for quickly convert files to the popular Microsoft format. EasyDoc Converter lets you get to work quickly by using a simple, clean, drag-and-drop interface. The converted document will be saved in the same directory of the original file.